The chair are great. Quality is good. Easy to assemble. We love the modern mid-century look. 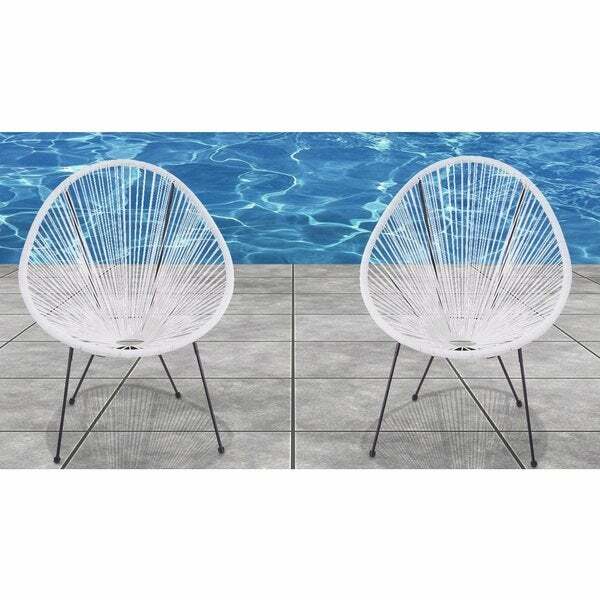 Take a rest after swimming with a friend in these Acapulco white lounge chairs. The resort-grade construction takes inspiration from classic woven furniture designs for time-tested durability and breathable comfort. So far, I like them. They arrive in a HUGE box. A tad cumbersome to push/drag into the house. (There's no way one person can lift it. It isn't heavy but it's BIG.) The chairs are easy to assemble. Your seven-year-old can do it. Just screw the legs into the chairs and "Ta-da!!" take a seat. The chairs are comfortable. You probably won't fall asleep in them but they are good for an hour or so sit. Most elderly people will struggle to get out of them and the chairs aren't heavy and could be unstable. I'd seat grandparents and small children elsewhere. The durability remains an unknown. I have a feeling they will hold up okay but will likely be a pain to clean. They're stylish and fun. A solid 4 for those seeking form over function. 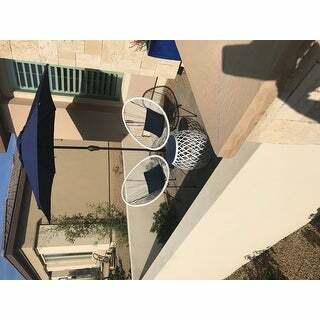 These chairs are a good looking modern patio set . they hold up well in weather as well! i love them and order them for model homes all the time! On time shipping. Good quality. Very happy with purchase. The chairs are great - good size and more comfortable than some I have tried. The packing came damaged but Overstock was very polite and it seemed like it was an item that had been returned so the poor box had been shipped around quite a bit. Three weeks later and I STILL haven’t received my chairs and no one from Overstock can seem to help me. I placed the order and a week later the tracking info showed the item was never given to UPS, so Overstock sent a replacement order, which also never arrived and had the same tracking status. I don’t know how other reviewers have been able to get the product. I was really excited about these chairs and sad Overstock can’t get it together to actually ship the package or provide me with a refund. Right now they’re sending a third order, which most likely holds the same shipping fate. Pretty sure Overstock sold this item when they were actually out of stock. I got a notification that they were shipped and delivered on the same day which seemed very odd. When I chatted with customer service they said the item was missing and offered to send a new set. When they came back after a few minutes of processing they said the item was out of stock. I'm disappointed that they weren't able to deliver the item and that the best they can do is send a refund.